Thinking about a new GPS? The task of choosing the one that's right for you can be very intimidating. With so many great brands, models and features to choose from, how do you know which one to buy? When picking a GPS, the most important question to ask is "What do I want to do with it?" Any automotive GPS unit will tell you where you are and where to go, without getting you lost. As RV'ers, we all have a set of basic needs our GPS must fulfill. Beyond that, it's completely up to you whether you want, and are willing to pay the extra money for certain features. The first factor to consider is what maps you need pre-loaded in your GPS. That, of course depends on where you plan to travel. Many systems come with road maps for the entire United States and Canada loaded into their main memory. Some come with all of North America and some come with Europe as well. This gives you the luxury to go anywhere without worrying about whether or not you loaded the proper maps; it also makes the device ready-to-roll, right out of the box. Pre-loaded maps occupy part of the main memory of the GPS; any excess main memory can be used for additional maps, MP3 Music, or custom POI's. This brings us to memory capacity. How much memory your GPS can hold is very important as well. If you purchase a unit that has very little extra main memory, and can't be expanded; you may find yourself unable to add features or points-of-interest (POI) when you want. Many GPS models only contain enough main memory to hold their pre-loaded maps, with very little left over. This is only a problem if they do not have a memory expansion slot. A memory expansion slot allows you to add memory to the GPS should you ever need it. Most take a Secure Digital (SD) card for memory expansion. SD cards are inexpensive and a great way to add memory to your unit when you need it. More expensive units typically have a considerable amount of their main memory free for your use, and also have a memory expansion slot. Less expensive units typically use most or all of their main memory for built-in features, but most of them still have a memory expansion slot. Another important feature to look for is "text-to-speech." Most voice-prompting GPS units will give an audio notification such as "Turn left in 300 feet" or "Take next exit." A unit with a A unit with a text-to-speech function will speak not only the direction but the name of the street as well: "Turn left onto Mulberry Lane in 300 feet" or "Take Exit 23A." This is a huge help for many people, especially RV'ers, as they won't even have to glance at the screen to know where to go. A great new feature to consider is live traffic service. Available in larger cities, a subscription to a traffic service gives you real-time, up-to-the-minute updates on traffic and road conditions. Freeway's blocked from Exit 23 to Exit 29? Your GPS will notify you and offer an alternative route. After a free trial period, traffic service typically costs about $7/month. Some Garmin units also offer XM Radio services, so that you can get not only live traffic but XM Satellite Radio as well. Even beyond a typical traffic service is the new Enhanced MSN Direct service. Many of the upper-end Garmin units, like the Nuvi 780 come with this capability. With MSN Direct, you can check the weather, avoid traffic backups, compare local gas prices, get enhanced movie listings, stock information, news and local events when you travel with your unit. Even plan trips from the convenience of your computer, via Windows Live Local, and then wirelessly send locations to your GPS. Like a traffic service, MSN Direct carries a monthly charge after the free trial period. One of the newest additions to GPS systems is the integration of a Bluetooth chip. If both your cell phone and GPS unit are GPS unit are Bluetooth-enabled, you'll be able to pair them up for hands-free calling, dial-a-POI features, and more, making your automotive electronics suite completely integrated. Many campgrounds POI lists take advantage of this feature on the Garmin GPS units and allows you to dial a campground hands-free from a touch of your GPS screen. Another new addition to GPS systems is the ability to play MP3 music. By loading your favorite MP3 music or audio book into your GPS you can play it either through the GPS' speakers or your in-dash radio. Many of the better GPS units also come with an FM transmitter to link them directly to your in-dash radio so the music comes out of your vehicle's stereo system. This is particulary useful since the GPS will automatically lower the volume of the music to give you directions, or if you receive a phone call. One of the most exciting new features is Garmin's new TourGuide™ capability. With TourGuide™ you can purchase completely guided tours for your GPS. Start the TourGuide™ and simply follow the tour. Your GPS will guide you to points of interest, explain them and even show you photos. It's like having your own tour guide right along for the ride. Among the most popular GPS navigation systems for RV'ers are the Garmin nuvi 200 and 360; the Lowrance iWAY 600C, the Garmin StreetPilot c550, the Magellan Maestro 4040 and CrossOver GPS, and the TomTom ONE 3rd Edition. So which GPS is the "best?" That depends entirely on your needs, your preferences and your budget. Phil & Karen King are full time RV'ers. 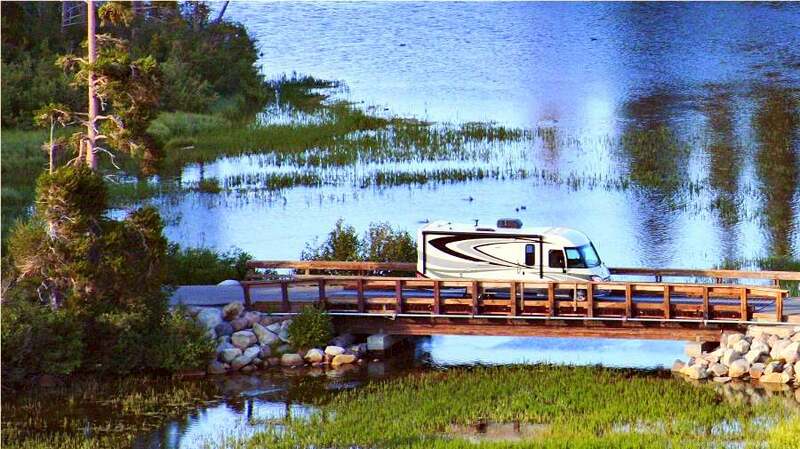 They travel 12 months a year and have extensive RV'ing experience.